More than 500,000 people gathered last Saturday in Madrid; around 350,000 in Barcelona; 20,000 in Alicante; 100,000 in Santiago de Compostela; another 100,000 in Valencia. Altogether, there were more than a million people in the streets in almost a hundred Spanish cities. In Madrid and Barcelona, the demonstrators finished the day by squatting empty buildings to help families that lost their homes because they couldn’t pay the mortgage. In New York that night, 10 to 20,000 people gathered in Times Square. The U.S. press, nevertheless, almost universally attributed the demonstrations around the world to Occupy Wall Street. “Buoyed by Wall St. Protests, Rallies Sweep the Globe,” “Occupy Wall Street Movement goes Worldwide” and “Occupy Wall Street go global” are some of the headlines that appeared. 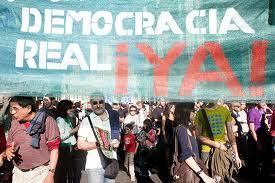 Even Democracy Now! followed suit with a report entitled “Global Day of Rage: Hundreds of Thousands March Against Inequity, Big Banks, as Occupy Movement Grows.” Each of these neglected to mention that Occupy Wall Street began with a call published by Adbusters magazine on July 13, and it was a full month and a half before, on May 30, that the Spanish Democracia Real Ya movement announced plans for a global demonstration for October 15. Throughout the summer, hundreds of people from Democracia Real Ya launched the platform Take the Square and worked hard to organize movements all around the world for October 15—Occupy Wall Street among them. They held international meetings to coordinate the preparatory tasks, including the Hub Meeting in Barcelona—which involved organizations from England, Greece and Italy—on September 15th. A Global Virtual Assembly was also held the weekend before October 15th. So why did the media so ignore all this organizing in Spain, where more people were in the streets than in the rest of the world put together? A lack of journalistic rigor, or just American egocentrism? +1000 to the idea of squatting in foreclosed homes. I think that’s a perfect idea for direct action. Occupy Homes. Would do a lot for the people currently suffering from the recession, or about to be, and would also draw a great deal of attention and tension, as Mr. King said was necessary, to the issue of families being thrown out their homes during an economic crisis. Personally, I think we’re lucky to even know about the protest, considering how failed the media here is. But fear not. The history books will give the credit to Spain. They are world heroes. The movement started months ago, and the protests started in the park in September. The news didn’t even know about it until October so how do you think they would know about Spain when they don’t even know about something going on in a park down the street? These people work in buildings blocks from where it’s going on.